Subscription box services have become increasingly popular over the last few years; the idea of paying a small subscription fee for a variety of products catered to your interests or hobbies is one of the best things to happen to e-commerce. One of the reasons subscription boxes have gained so much popularity is the actual boxes or unique packaging used to mail products. 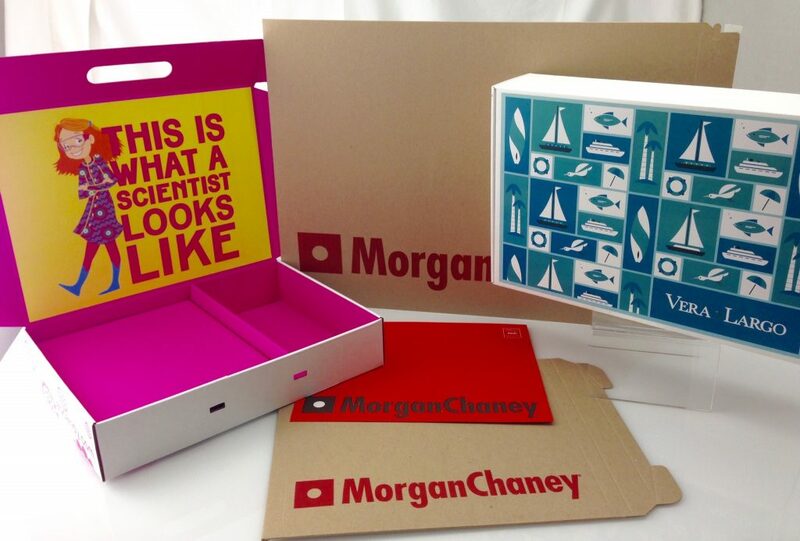 A custom designed box curated for your customers shows that you are fully invested in your brand and products. A box can provide protection for your products as well as entertainment or utility for your customers. Some companies use custom reusable packaging products to give their customers even more value, while also providing a conversation piece and better marketing reach. 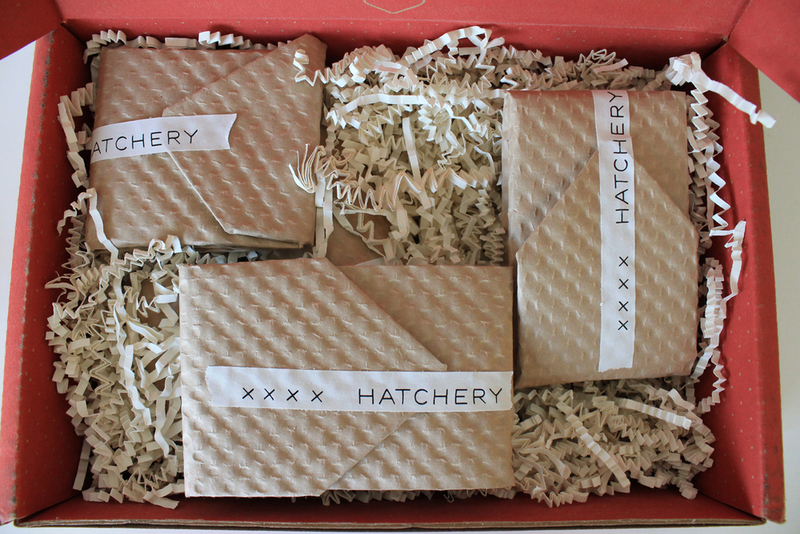 Subscription boxes exist for just about every niche, from makeup to clothing to food items. They make a wonderful gift and are a great way to try new products without breaking the bank. Packaging for subscription based companies can be as simple or unique as desired but it does take some careful planning and strategy to achieve. Design Functionality – Think about the customer’s experience when opening the box or packaging and how the products inside are presented to them. First impressions can make a huge difference! Many companies use tuck-top mailing boxes because they are easy to use and can be opened from the top to see the products inside. Materials – Most subscription boxes use e-flute cardboard because it is secure and strong. If making bags or alternate packaging, think about materials in terms of cost and durability, as well as protection for your products. 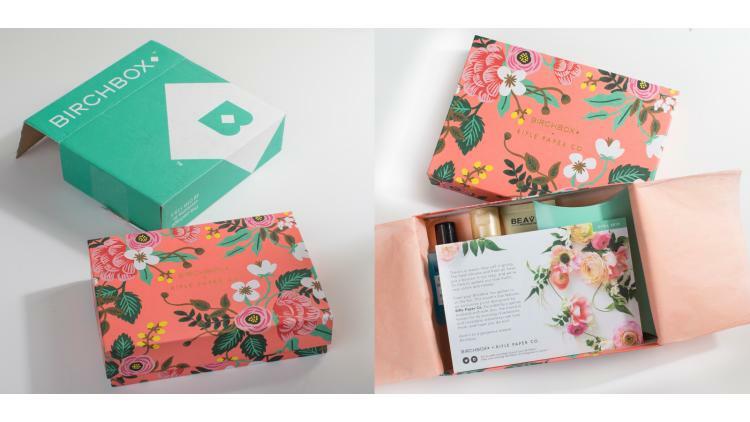 Packaging that can be reused or re-purposed is popular for subscription box companies, but it is more costly. Shipping Methods – Size and weight of the packaging effects the shipping costs, and products must arrive to their destination safely and securely. Product Safety – Make sure to secure your products! 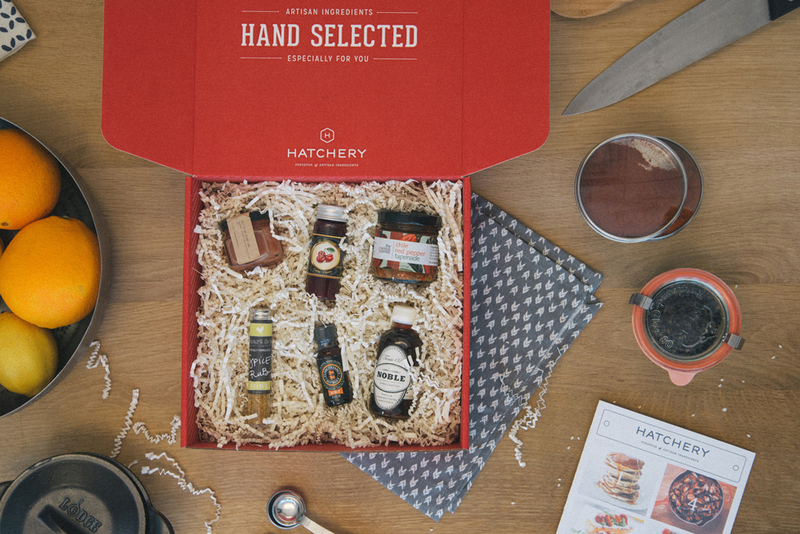 No one wants to receive broken products inside a subscription box. Colors & Brand Image – Stay consistent with the brand image you want to portray by using your logo(s), colors, and design style on all of your packaging. Accessories – Tissue paper, tags, labels/stickers, postcards, and business cards can all be useful branding and marketing tools to include in your subscription boxes. Lead Times – Custom packaging can take anywhere from weeks to months to manufacture and ship, so companies must plan ahead and anticipate future needs when it comes to subscription based packaging options. Boxes, bags, mailing envelopes; all great choices for your subscription service depending on the products you will be shipping. Making sure your products arrive to their destination securely and unharmed is the first priority when deciding your packaging elements. Design and brand image come second. It’s always important to think about your customer’s experience receiving and opening the box. A package that arrives damaged gives an automatic negative first impression to your customer. And this amplifies if the products inside are damaged, leaving an issue that your customer service department has to then take care of. Make sure you research and develop ways to package your products securely in your custom packaging. Methods of safe packing that are more stylish than bubble wrap include crinkle cut paper shred, tissue paper, and packaging papers. Boxes can also be designed with die-cut interiors or trays to fit specific products. Customers usually appreciate aesthetics when it comes to subscription box packaging. They are paying for an experience, like giving a gift to themselves, and the packaging should reflect that. Packaging design should stay consistent with the company’s brand image, and color scheme if applicable. Having an easily recognizable box is a great tool for creating positive associations and extending marketing reach. In some cases, a plain mailing box may be used with the custom designed packaging inside, or the mailing box itself can be customized if it makes more sense for your company. Many established subscription companies use custom printed exterior shipping packaging as well as customized interior packaging. Custom printed tissue paper makes a great addition to your custom subscription box or packaging. Tissue paper can be ordered in stock colors and prints, although custom printed tissue paper is highly recommended for supporting and reinforcing your brand image. Custom labels can also be used to close the tissue paper for a custom finishing touch. Custom postcards are often used inside subscription box packaging to provide an offer or reminder to the customer about where to purchase more products, refer friends, or get a useful discount. Custom subscription boxes don’t actually have to be ‘boxes’ even though that’s generally what they are referred to as. Bags, mailing envelopes, tins, and tubes can all be used to ship subscription based products. Some of these options will still need to be packed into a shipping box, but the outer shipping box doesn’t have to be customized as long as the inner packaging is. Some companies choose to customize their outer shipping boxes as well as the interior packaging, presumably so the customer knows what the package is before opening it. 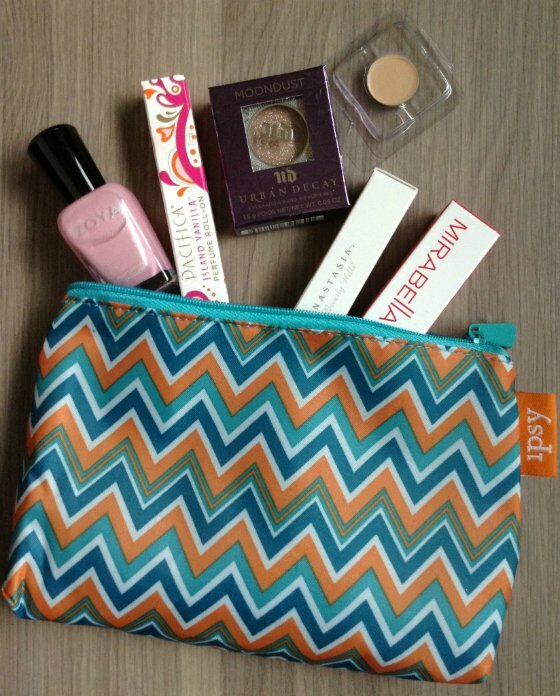 Ipsy is one of the most notable subscription companies that uses a bag for their products, and they use a uniquely designed bag every single month! There are some companies that send food products in reusable tins or other types of reusable packaging. If complete custom packaging is just not on your horizon yet, there are many lower cost alternatives that allow you to customize your packaging. You can order in-stock products ideal for packaging and shipping your products, like tuck-top mailing boxes, corrugated boxes, and mailing envelopes. Then, you can design custom printed labels, postcards, tags, and tissue paper to help keep your brand name and logo part of the experience. It is essential to have branded packaging when dealing with a subscription box, because your customers need to recognize and remember where these packages are coming from. With some of the lower priced options available, it’s possible for any company small or large to achieve custom branded packaging. When shipping food items there are a few extra issues that must be addressed. If your food items are already packaged individually, then you don’t need to worry about making your other packaging food-safe. If your food items are not pre-packaged, you will want to create food safe liners or trays to fit inside your custom boxes. Some of the custom options available include food-safe tissue paper, food safe paper or paperboard, and custom designed plastic trays or wrappers. There are endless options available for customization and unique branded packaging for your food items, as long as you ensure the packaging is safe for direct food contact. You also have to consider how secure your packaging is so that your food items don’t get crushed or broken during the shipping process. Oftentimes standard food packaging is adequate to keep food items safe and secure, but extra thought is needed with more customized packaging. Dollar Shave Club has a pretty simple business model. Customers choose the razors they want and the frequency, to make shaving much easier and less expensive. 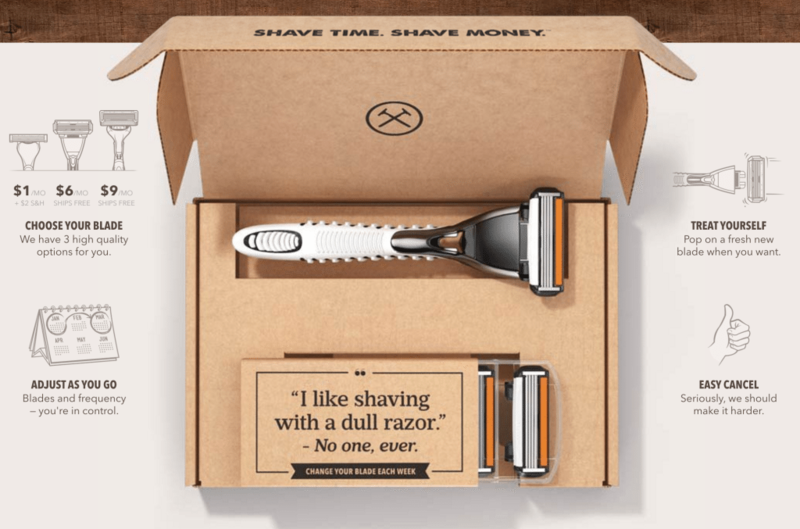 Dollar Shave Club razors work for men and women, although their no-frills packaging is definitely marketed towards men. Their cardboard e-commerce mailers contain simple black ink printed graphics and are specially designed to hold the products in place. You can also find matching custom sleeves for the razors, and usually a fun graphic comic “newsletter” inside every box. 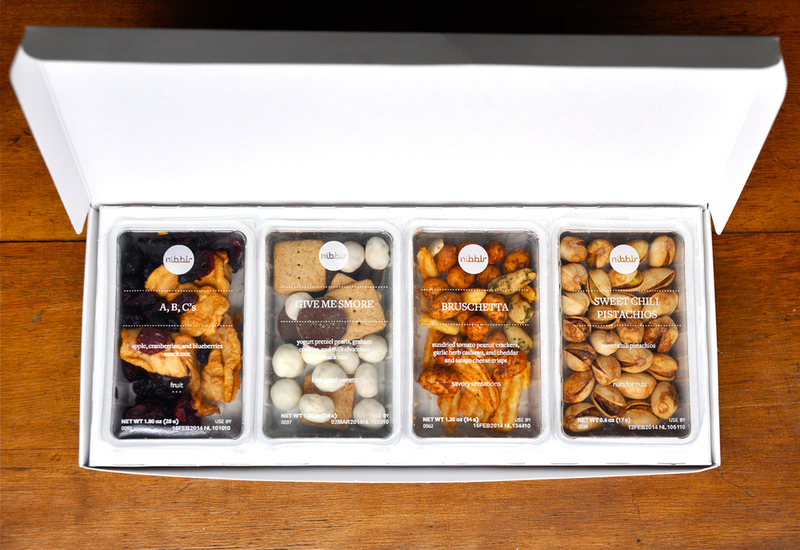 Their simple custom packaging can be mailed directly in one box, so no need for packaging waste and unnecessary costs. 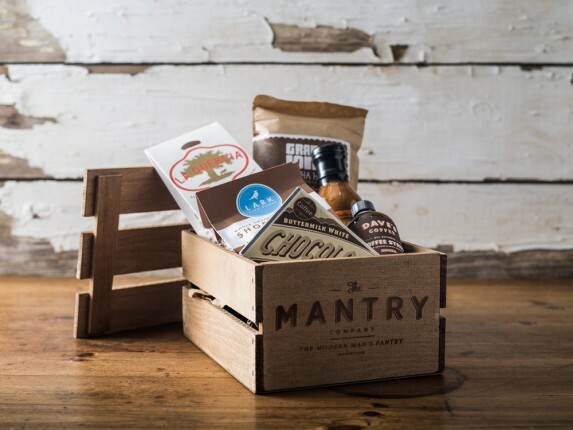 For more ideas for creating custom subscription box and e-commerce packaging, see our gallery at www.morganchaney.com. Contact us for information on ordering custom printed packaging.